A couple hours north of Atlanta, the scenery drastically changes. Midtown skyscrapers and Buckhead malls are replaced by mountain peaks and apple orchards. But the comfort of the city doesn't have to be exchanged for the benefits of nature. #1 My Mountain Cabin Rentals provides folks with luxurious, yet rustic inspired escapes. My Mountain, a 1,500-acre mountain neighborhood, is a vacation destination in Blue Ridge of North Georgia. 32 log cabins (and we aren't talking "Daniel Boone" type cabins) reside on My Mountain and are managed by Buffy Turner, owner, and her staff. The office is located at 3945 Old Loving Road, Morganton, Georgia. My Mountain cabins are ideal for couples, families or groups of friends; guests can find plenty of activities nearby or enjoy themselves without ever leaving the cabin. The staff often tell people to stop by at the grocery store on their way here so that they can spend the weekend relaxing and enjoying the view. The scenery alone is certainly worthy of attention. All of the hideaways on My Mountain blend in with the foresty, not detracting from the landscape. The wooden signs outside the cabins inform passerbys of the owner's names and hometown and contribute to the charm. With each turn of the road, drivers are treated to another burst of sunlight streaming through the trees or a brief stretch of open road that allows a glimpse of the Blue Ridge mountains because of the blue haze (which is where the name Smokey Mountains derives from). We don't even have to mention how brilliant the leaves look during the "leaf season" in the Fall. The cabins are equally as impressive as the surroundings. My Mountain Cabin Rentals wants to provide their guests with more than what they have at home. Most rental cabins are equipped with a sizable deck, outdoor hot tub, fireplace, pool table, WIFI, satellite TV, central HVAC and full kitchen. Most decks are screened to deter any pesky mountain insects and are furnished with tables, chairs and porch rockers and swings. The interiors are upscale, yet appropriate for the area, with details such as antler chandeliers and tongue & groove sided walls. Maintained in an immaculate condition, the cabins smell like fresh cedar. Each one is spaced far enough apart to allow for plenty of privacy. What could be nicer than enjoying an evening in the hot tub while star gazing or watching the blue and pink mountain sunrise from your deck? Should you be compelled to leave the cabin, the area is known for its array of outdoor activities. Options include white water rafting (the 1996 Olympic's white water rafting venue is just 30 minutes away from My Mountain), horse back riding, lake and stream fishing, mountain biking, hiking and some of the best motorcycling roads in America let alone North Georgia. Two of the top 10 rated roads in the country for motorcycling are on highway's 60 and 129 (Tail of the Dragon), full of twisty's and turns and begin only minutes from My Mountain. My Mountain Cabin Rentals even offers fellow bikers a year-round 10% discount off their stay. When you check-in, be sure to ask for the free motorcycling map showing all the back paved and gravel roads with gas stations and eating places. Some cabins are designed to allow easy bike access. The hills and ubiquitous trees in the My Mountain neighborhood also provide a tranquil background for an early morning or late afternoon walk. If you prefer something less strenuous, nearby Blue Ridge is a delightful town populated by pleasant residents. In fact, we feel the people who live and work here are the mountain's best amenity. The Fall is the perfect time to meander through the streets of downtown Blue Ridge while nibbling on pumpkin fudge or to stop for a cup of coffee and chat with visitors. One of the most memorable times mentioned by guests was picking apples out of Mercier Orchards after a tractor ride. Then deciding that after that hard work, they were entitled to one of Mercier's world famous "fried apple pies" and some elk sausage. The apple pies are so tasty that you will surely buy some extras for breakfast the next day. My Mountain Cabin Rentals has seen some of their guests 15 times or more since 2003. Buffy lives on My Mountain and Tracy lives 2 miles from the office and are available for after hours attention. My Mountain Cabin Rentals proudly goes above and beyond the typical management service in the area. In February 2010, the staff and a few neighbors used their 4 wheel ATV's to carry guests, groceries, suitcases and dogs up and down My Mountain when they were stranded due to a freak snow/ice storm that paralyzed the road to My Mountain late one Friday afternoon. With all the area has to offer, My Mountain Cabin Rentals could get by without the attention to detail but Buffy and Tracy feel their attention to detail is what separates them from other cabin companies. That is why My Mountain Cabin Rentals has been so successful and continues to grow. Our management office, located at the entrance to My Mountain, stays open 7 days a week, should any problems arise. Unlike many other getaways, My Mountain Cabin Rentals allows furry four-legged family members in pet friendly cabins as well. Pet emergency phone numbers, along with Poison Control, EMS, Fire, Police contact numbers are displayed on the refrigerators and near the main phones. The next time you find yourself needing a break from the traffic, pollution and sound of sirens, consider a trip to the North Georgia Blue Ridge Mountains and call us toll-free at 800.844.4939 or email [email protected]. 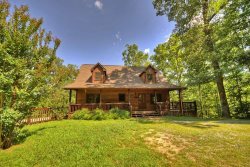 My Mountain Cabin Rentals offers vacation property management services for properties located in the My Mountain Phase I, Phase II, Meadowoods, My Forest and Builder's Hill communities of North Georgia as well as other nearby areas. Our mission is to make cabin renting a convenient and pleasurable experience for both vacation home owners and guests alike. We pride ourselves in offering the highest value accommodations and service possible for a fair price. We invite you to compare our rates vs. value against any other cabin rental company in Blue Ridge, North Georgia. For owners, we offer complete absentee owner cabin management services at no extra charge. For guests, we offer quick and friendly service attending to your requests and needs to the very best of our abilities. We promise!